Yesterday I finished this project – a new slipcover for a friend. The fabric is Sunbrella fabric and fits to the chair like a glove. Here is the original fabric of the chair. It also had a slipcover on it but I forgot to take pics before I started the project. 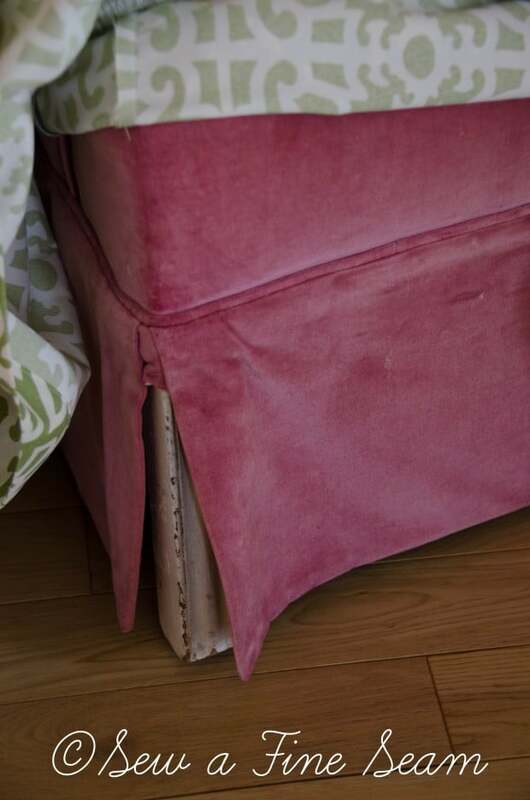 The slipcover had been used so long the seat was worn completely to shreds – literally. This chair has been used a lot but it is still so comfortable. I can see why my friend wanted a new slipcover for it! I think the piping adds a lot of fun detail to this one. And adding piping is nowhere near as hard as it looks. 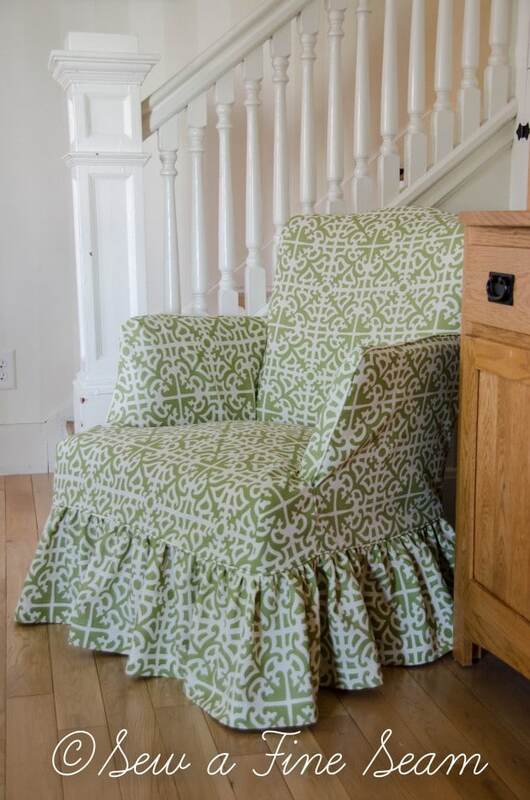 I made the piping out of the same fabric as the chair – making piping isn’t hard either. I did take some pics of the process and I’ll share a tutorial soon. 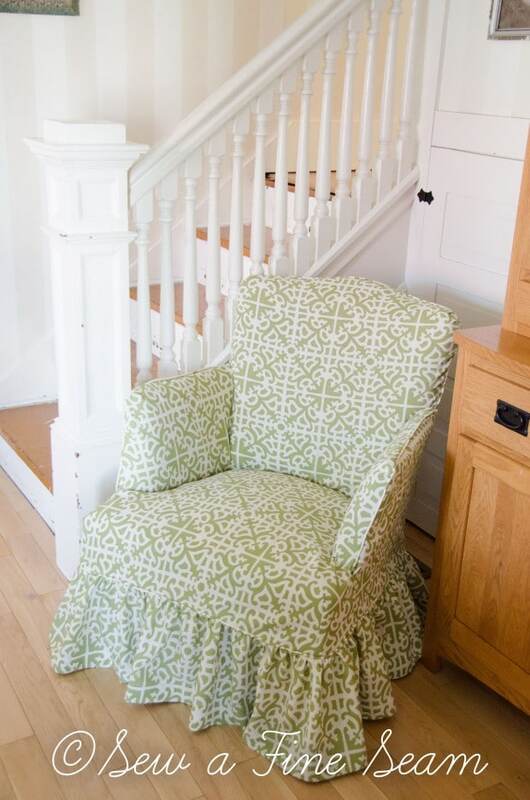 I said I could understand why my friend wanted a new slipcover for this chair – what I can’t understand is why she hired ME to make it when she is a much more experienced seamstress than I am! She and her Mother made the first slipcover and I cringed when I compaired mine to theirs. Theirs was perfect. Everything fit exactly. Can you see in this photo above and also in the photo below the trouble spots I had? The little places that didn’t lay exactly like I wanted them too? Their slipcover didn’t do this. I consoled myself with the fact that this fabric was a bit stiff to work with and it IS a slipcover not a reupholster job! Now to see if it passes inspection when my friend picks it up 😀 It does look good in a photo – and no seams popped when I sat in it – heehee! Jill, it looks GREAT!! I love the chair. Green is one of my favorite colors. This would go perfect in a sewing room. 🙂 I’m just sayin. 😀 It would go great in a sewing room wouldn’t it Loretta?! That slipcover is gorgeous! I love the fabric! Thanks so much Beth! Still thinking of you a lot and saying prayers for your family! oh Jill that is gorgeous fabric. How happy. Love the color and the print. You asked me about that recipe plug in. I believe it is called recipe card. It has not given me any troubles. It is a happy print isn’t it Debbie? 🙂 And thanks for the info on the plugin! 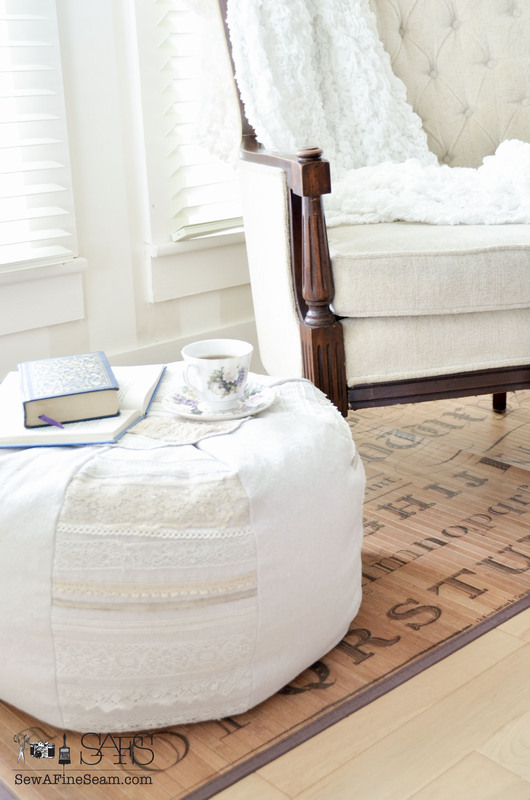 I love the style of that slipcover you made! Love the ruffles you gave it. Such a pretty pattern. You do good work! Love it! I have a question about the piping. Do you cut it on a bias? It seems like extra sewing involved in piecing the strips together. Hi Diana, sorry I’m so slow answering your question – NO! I don’t cut it on the bias! I have a tutorial on making the piping that will be on the blog tomorrow and I talk about how I cut it out and how I sewed the strips together if I didn’t have one long enough. I love using Sunbrella fabric. I have several pieces of teak furniture and the cushions are all covered with Sunbrella. It is expensive but lasts forever and the patterns are so gorgeous. Nice slipcover, really makes the chair, much better than the original fabric. Have a great day. Oh I’m sure your cushions are gorgeous! I like the way sunbrella fabric wears too – I need to make some pillows for my porch – somehow I’m always making stuff for someone else! ha! You go girl ! Beautiful. Wish I had that talent. Waiting on that tutorial will be a nail biter….Love the chair you are very talented. Looking forward to the tutorial…. Jill, What a beautiful project! Your timing is perfect, as I have several chairs I need to update at our lodge this summer. Would love it if you give us some tips! Congratulations on being published in “Celebrating Everyday Life!” I will get a copy. Thanks for sharing your great talent and ideas. Always a joy to see into your life. Thanks so much Carla! I am sharing how to make piping tomorrow on the blog. For some great video tutorials on making slipcovers hop over to Miss Mustard Seed’s blog and scroll towards the bottom – in her sidebar you should find the link to them. If you don’t email me and I’ll try to get a link for you. I need to make some tutorials of my own as I’ve had several people asking if I have any! 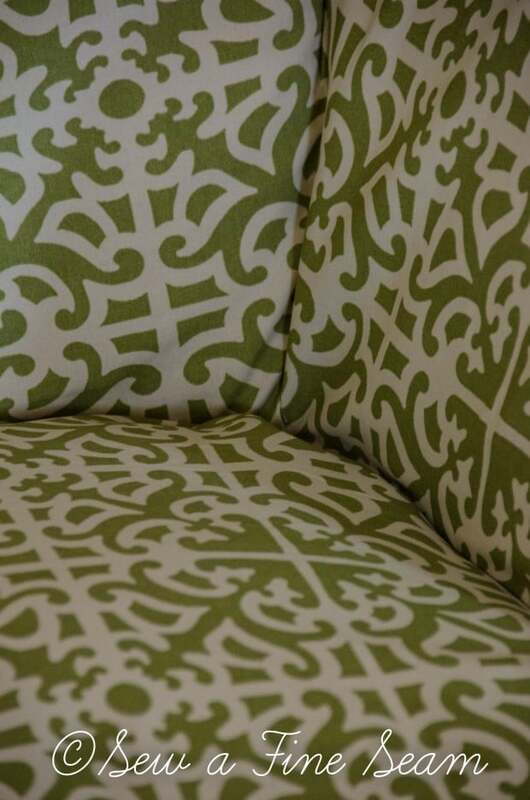 Jill, what a wonderful job you did on the slipcover…I need to cover some chairs but am scared to take the project on. Do you have any tutorials for that? Look forward to more of your fun projects! Hi Cecelia – I don’t have great tutorials of my own on slipcovering but Miss Mustard Seed has 6 video tutorials that I watched and they helped me out tremendously. You should be able to find them in the side bar of her blog – scroll down – it’s towards the bottom I think! What a gorgeous job you did on that slipcover, no wonder you said you’re so busy. Wish I could help you out somehow. That fabric would go really well with my new curtains. I am so envious, love that fabric and slip cover, I want one for my chair, different style tho. Oh how I wish we lived closer to each other, I need a slipcover for the chair that has pinkish/bluish plaid upholstery, ugh. It’s a good chair I got at Habitat maybe 4 yrs. ago, don’t remember for sure. We’ve been prepping walls and hubs plugging holes, I sanded the spots on wall he fixed yesterday, then vacuumed up dust on walls and baseboard. Took bakers rack out of kitchen onto back deck. Washing all my bowls as they get so dirty out in open. This has got to be the dirtiest place we’ve ever lived. Just not enuf room in this place to keep things like bakers rack in here when we have so much all over for painting. Think time for big time purging. Have stuff that hasn’t been seen/used in long time. Time to say adios. I’ve got all the sheers washing, after winter I like to wash curtains that stay up and also ones being put away so they’re not put away dirty. Take care of yourself Jill, take time to breathe. Do you do well when you get stressed out? I can’t function well at all when I’m too stressed, nothing goes right so I’ve learned to take it one thing at a time, things get done in good time and I’m not a raging lunatic. Too bad it took me so many years to learn that. I always felt so pressured to do so much, nothing would go well, duh. I’m glad hubs is doing good job caulking between seams, along base boards, etc. Mobil homes have panels for walls then they put little strips over the seams. Panels are covered with some kind of plastic sort of like covering, ugh. It’s almost 4:30 here so have feeling we might not get much painting done. Thanks JaneEllen – and it sounds like you are coming right along! I hope you have things painted by now – I’ve been madly preparing for the flea this weekend and haven’t opened my computer since sometime last week! I love that fabric. What an adorable slipcover!! Hi Jill, I’m visiting from Miss Mustard Seed. What a beautiful slipcover you made! And that fabric is gorgeous. Thanks so much! I’m thrilled that you came over to visit! You did a lovely job! I do slipcovers, but I’ll only use indoor/outdoor fabric on things like pillows & cushions. It doesn’t “give” enough for curvier pieces. Your friend will love it! Thanks Denise. you are right the sunbrella fabric doesn’t give a lot – I’m glad this chair wasn’t super curvy! Popping over after seeing your share on Miss Mustard Seed. I think you did a beautiful job! I made two slipcovers so far. They’re far from looking as nice as yours, but they do the job of covering the very worn and shredded upholstery. 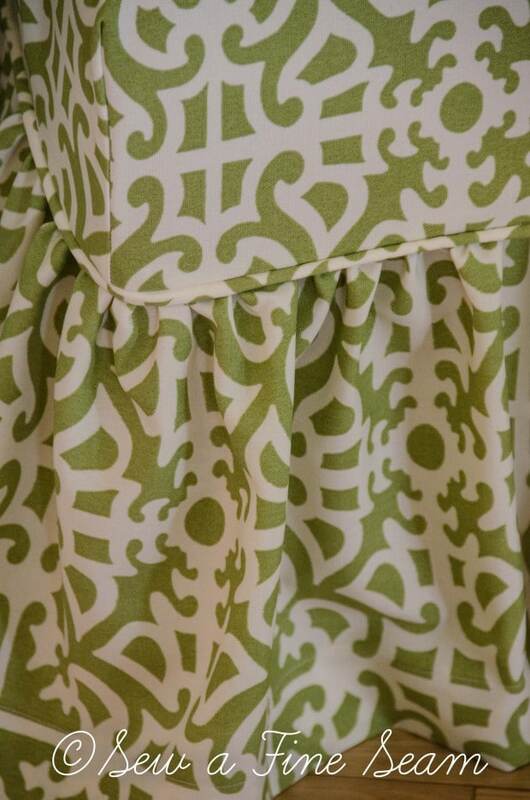 I can’t imagine trying to sew a fitted slipcover with Sunbrella. That would certainly be a challenge. 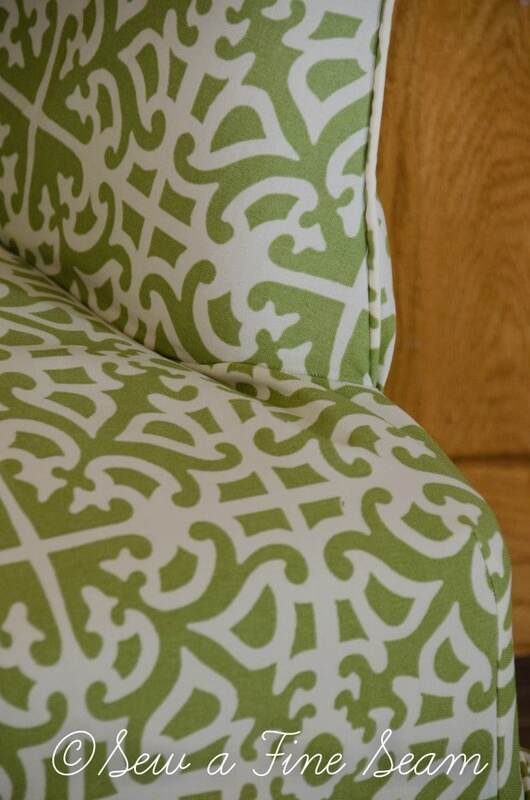 Thanks so much Tanya – Miss Mustard Seed has some video tutorials on making slipcovers and they helped me out a ton! I’d made a couple before I watched those and watching them showed me some really great tips and tricks. Gave me the confidence to do custom slipcovers for other people! 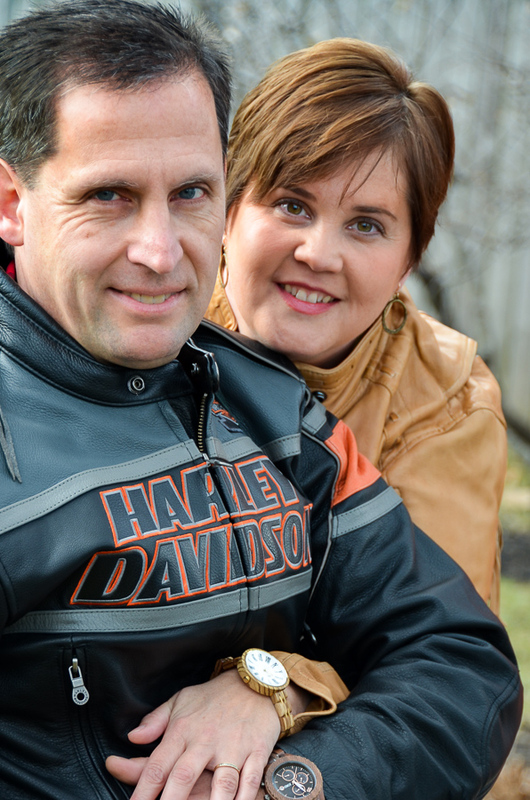 Love your chair and what you did–I wish I could sew like that! Your chair is beautiful, love the fabric! Thanks Rhonda it is a fun fabric isn’t it?! I think you did a great job on the slipcover and the chair looks awesome! Sunbrella is very stiff fabric and can be much more difficult to work with, so “kudos” to you for making it look so fantastic! The chair looks awesome! And the magazine does too! What is it about a pretty cake that is just so inviting? Thanks! Can you believe I haven’t taken time to order my print copy of the magazine? I always flip through the digital one quickly and then go order the print copy. But I’ve been so busy I haven’t done it! And it’s almost the deadline for my next contribution!